Typically marathoners perform best when they run in cooler (40-55 degrees (F)) temps. For many runner’s their best chance to have a good time is with a Fall Marathon. Use this Fall Marathon Guide to select a race & follow the numerous links for valuable training information that can help you achieve your goals. The only “pitfall” for training for a Fall marathons is that you need to putting in the biggest miles of your plan in the hot summer months. However, the good news is that this is a time when the days are long, and you don’t have worry about ice and snow. Also, there’s typically plenty of build-up races (1/2 marathons & 10ks) available during the Summer or early fall. You can integrate these races into your training schedule and use them as a way to to test your fitness. Throughout this blog, I provide I number of detailed references which can be used to help you train for your race. I recently published a detailed marathon training follow along of my training for the 12 weeks leading up to Portland’s Foot Traffic Flat marathon. Posts include details of how to set race goals and training paces, nutrition, how to make adjustments to your training, strength training for marathon runners and much more. Here’s a list of some great Fall Marathons. As you can see, I provide some details of each race (like if it’s a flat course, good crowd support, etc). I also include feedback from previous participants so you can decide which marathon is best for you. If you’re interested in participating in any of these races, please let me know if you would like some help setting your goals or setting up a customized training plan that will be specific to your athletic ability, goals and your busy schedule. I specialize in working with busy middle age athletes, so please contact me if you have questions. Bank of America Chicago Marathon – huge race (45k+), but very well run and tons of spectators throughout the fast & flat course. One of my best running experiences was at the 12 mile point in this race (downtown and packed with loud cheering spectators, truly amazing). Medtronic Twin Cities Marathon – very well run & supported race on beautiful twin cities course. Tons of spectators. This race gets fabulous reviews, year after year. Typically perfect racing conditions. Steamtown Marathon – net elevation loss of almost 1,000 ft. Good course to BQ, but be careful with the 2 hills near the end. Gets very favorable reviews from past participants. If you live in the Northeast, this is an excellent alternative to the bigger Fall marathons. Portlandathon Marathon – for 1 year, the owners of Portland Running Company and the company that manages many Portland area races, will operate a marathon in the City of Portland. The course will differ slightly from the Portland Marathon, but it’s still a USATF certified and BQ course. Nebraska Marathon – starts/ends downtown with much of the course near the Missouri River and into Council Bluffs, IA. A fairly new race, but has excellent reviews from participants. Baltimore Marathon – mixed reviews due to hills in the 2nd half and because ½ marathoners converge with marathoners in the 2nd half of the race. It’s a challenging course that may not be best for 1st timers or runners hoping for a BQ. Past participants generally rave about how well the race is organized and run (lots of aid stations). Crowd support is excellent. Nationwide Children’s Hospital Columbus Marathon – very positive reviews from past participants. Most had a great experience between expo, pre and post race activities. It’s well organized and there’s excellent crowd support. A few hills, but nothing that runners complained about. Bottomline, it’s highly recommended. Edward-Elmhurst Health Naperville Marathon – small race in suburb outside of Chicago. It’s not the fastest course (due to a few hills and lots of turns), but if you don’t want to run in Chicago with 40k+ other runners, this is a good alternative. Detroit Free Press/Chemical Bank Detroit International Marathon – Good organization, but not a lot of crowd support during the middle of the race. Relatively flat course, but there is a climb up the Ambassador Bridge which is a little steeper and longer than many would like. This race has been selling out because it’s very popular, so register before end of August to ensure you get in. There is an underwater mile between Miles 7 & 8. 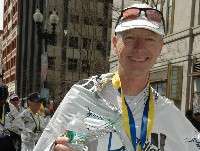 Ashworth Awards Baystate Marathon – billed as BQ marathon because of it’s mostly flat course. Right outside of Boston along the scenic Merrimack River. Gets a lot of positive feedback for being well organized. Scotiabank Toronto Waterfront Marathon – very well organized, plenty of water stations and exuberant spectators throughout the course. Relatively flat (just a few hills) course, so it sets up nicely as a Boston Qualifier. Marine Corps Marathon – this was my first marathon 30+ years ago, when approx. 9,000 runners participated (really big for back then). It’s now a much bigger race with 30k+ participants. Because there’s no corrals at the beginning, it can get a little crowded. Past participants have commented about how the beginning of the race is tough when after mile 1 the course narrows significantly. Overall, mixed reviews, but many are positive. You get to run by a lot of monuments, so it’s a memorable experience. Indianapolis Monumental Marathon – 10th most Boston Marathon Qualfiers among all North American marathons, with this flat, fast course. Lots of crowd support, bands, cheering sections. Very positive comments from participants. TCS New York City Marathon – The largest marathon in the U.S. Not much for me to say here as most runners are very familiar with this race. If it’s on your bucket list, definitely apply and train hard because it’s a tough course through Central Park and across the Verrazano Narrows Bridge at the beginning. Anthem Richmond Marathon – Really positive race reviews from past participants. Many rave about the course, organization and fan support. A lot of runners say they would run this race again because they had such an enjoyable experience. Rock ‘n’ Roll Las Vegas Marathon – mixed reviews, mostly bad, about the course. It’s fun to run through the Vegas lights in the evening, but most complaints centered around the course and challenges with the start (in 2017 additional security measures were taken due to the mass shooting in October). Lots of bands, entertainment and crowd support throughout the race. They offered a finisher jacket in 2017. Fort Worth Marathon – Fast and flat out and back course along the scenic Trinity River. Don’t expect big cheering crowds or perfectly executed signage at every mile. The course is out and back. Not many spectators line this course. Williams Route 66 Marathon – this is a challenging course with multiple hills. Overall reviews are favorable because the support is excellent, expo was fun and the course through the neighborhoods of Tulsa gets lots of local support. California Intl Marathon (CIM) – billed as fast course with net downhill. This course has wide streets so you don’t feel overly crowded, but with rolling hills for the first 20 miles, If you don’t train for hills, your quads may be “trashed.” Bottomline, you can BQ here, but you must train on hills prior to coming to this race. BMW Dallas Marathon – This is a highly regarded race. It’s 40+ years old and they have plenty of spectators on the course to keep you motivated.